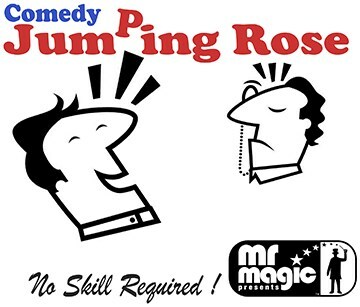 Jumping Rose' is another great opening 'Quickie'. The performer enters stage, stands facing the audience. He points towards a beautiful red rose fixed at the top of the left breast pocket of his jacket. He takes the flower in his hand, throws it towards audience but the flower instantly returns to the top of the left breast pocket of his jacket! This is a great gag to perform anytime in your act. Very easy to learn! Guaranteed Laughs!! !